Think of air blowing in through a window. 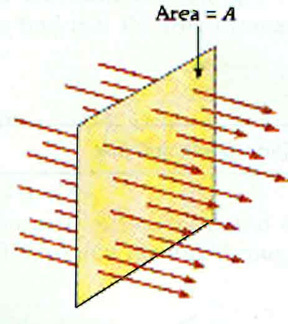 How much air comes through the window depends upon the speed of the air, the direction of the air, and the area of the window. We might call this air that comes through the window the "air flux". 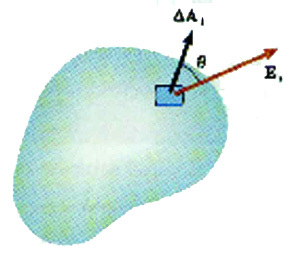 If the electric field E is not perpendicular to the area, we will have to modify this to account for that. You can also think of the electric flux as the number of electric field lines that cross the surface. Both forms say the same thing. 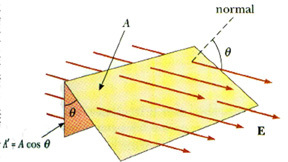 For this to make any sense, we must be talking about an area where the direction of A or n is constant. For a curved surface, that will not be the case. For that case, we can apply this definition of the electric flux over a small area A or A or An. 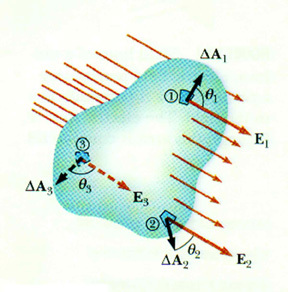 We will consider flux as positive if the electric field E goes from the inside to the outside of the surface and we will consider flux as negative if the electric field E goes from the outside to the inside of the surface. This is important for we will soon be interested in the net flux passing throught a surface.